"They have tried to tame it, shave it, fence it, cut it, dam it, drain it, nuke it, poison it, pave it, and subdivide it," writes Timothy Egan of the West; still, "this region's hold on the American character has never seemed stronger." In this colorful and revealing journey through the eleven states west of the 100th meridian, Egan, a third-generation westerner, evokes a lovely and troubled country where land is religion and the holy war between preservers and possessors never ends. Egan leads us on an unconventional, freewheeling tour: from America's oldest continuously inhabited community, the Ancoma Pueblo in New Mexico, to the high kitsch of Lake Havasu City, Arizona, where London Bridge has been painstakingly rebuilt stone by stone; from the fragile beauty of Idaho's Bitterroot Range to the gross excess of Las Vegas, a city built as though in defiance of its arid environment. In a unique blend of travel writing, historical reflection, and passionate polemic, Egan has produced a moving study of the West: how it became what it is, and where it is going. "The writing is simply wonderful. From the opening paragraph, Egan seduces the reader. . . . Entertaining, thought provoking." "A western breeziness and love of open spaces shines through Lasso the Wind. . . . The writing is simple and evocative." Timothy Egan lives in Seattle. 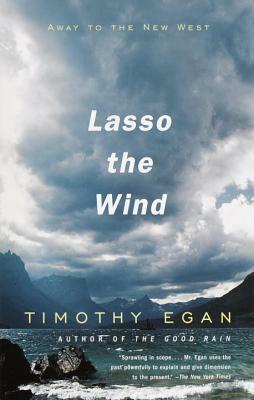 "Lasso the Wind is like a good road trip across the West. You drive, you stop to camp, you fall in love, and then you decide to stay. Egan's words are helping to settle the political chaos of this changing landscape. Alongside his sharp eye for details and clarity of mind is an ethical spine that is helping to shape the new West. I'm so glad he's here." "Here is the REAL West of today--some of it still Old West, much of it New--told in wonderful, entertaining style by one of America's most perceptive journalists. Egan is himself a well-rooted Westerner, and we couldn't ask for a better guide to all the excitement and change going on out there today."